Sibling Harmony is Kim, Kurtis, and Kevin Bueltmann who perform creative and insightful original Christian songs for all ages. They use guitars, drums, vocal harmonies, and multi-media to engage and inspire audience members at their concerts geared for the whole family. 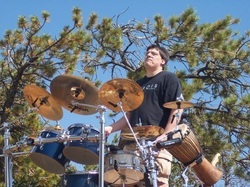 All three siblings play a variety of instruments and actually take turns playing each others' instruments in concert including Kurtis' drum-set which is played while standing up. These three siblings are all full-time church workers trained in and/or serving in Youth and Family Ministry. They grew up in central Illinois, but after college, went their separate ways to various states and countries. After they all ended up back in the Midwest, they felt that they were close enough to form the band. “Sibling Harmony” refers to not only being siblings, but to being brothers and sisters in Christ. Kim Bueltmann is a Deaconess at Concordia University in Mequon, Wisconsin where she serves as Campus Ministry Assistant, working with various student ministry groups on campus. After receiving her Deaconess training at Concordia University in River Forest, IL, she completed a 2 year internship in Gifhorn, Germany. Just prior to arriving at CUW, Kim was a Deaconess of Youth and Family Ministry at St. John Lutheran Church and School in Champaign, IL. 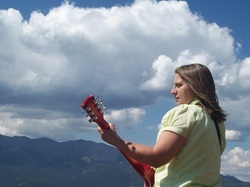 Kim enjoys music of all kinds and loves trying to learn new instruments. She also travels whenever possible and aspires to see the world. Kim is always happy to be outdoors, whether hiking, boating, or playing soccer. Her greatest joy comes from spending time with friends and family, which includes her parents, brothers, sisters-in-law and 19 nieces and nephews. Kurtis Bueltmann lives in Monticello, Illinois, with his wife Cyndi and four children, Jacob, Abi, Augie, and Jordan. Kurtis spent twelve years as the Executive Director at Camp LuWiSoMo in Wild Rose, Wisconsin, three years as Assistant Pastor at Immanuel Lutheran Church in Belvidere, and currently serves as Pastor at Faith Lutheran Church, a mission congregation in Monticello. He graduated from Concordia University – River Forest, IL, with a BA in Secondary Education while also completing the coursework for the Director of Christian Education program. He attended both Concordia Seminary – St. Louis, MO, and Concordia Theological Seminary – Fort Wayne, IN, and was ordained at Trinity Lutheran Church in Wautoma, WI. Kurtis loves sports, computers, reading (esp. sci fi & fantasy), martial arts (currently a 2nd degree black belt in Tae Kwon Do), and, of course, music. Kevin Bueltmann lives near Peoria, Illinois where he is serving on the pastoral staff at St. John's Lutheran Church in Green Valley Illinois. He has served as a DCE in Kalispell, Montana and Normal, Illinois and as Director of Camp Luther of Nebraska and most recently worked at Camp CILCA near Springfield Illinois. He has been writing children's songs professionally since 1999. Kevin graduated from Concordia University in Seward, Nebraska where he also got his Master’s Degree in Family Life Ministry. Kevin enjoys spending time with his wife and four children and enjoys sports like racquetball and volleyball.